The EU Clean Energy Package brings changes to the way countries must draft and report integrated National Energy and Climate Plans (NECPs) and long-term renovation strategies to decarbonise the building stock by 2050. The project will develop capacity and transfer knowledge enabling municipalities and civil society to integrate building renovation strategies in local and National Energy and Climate Plans. The project will enable the target groups to fulfil the Clean Energy Package requirements, while creating lasting benefits in Romania and Bulgaria. The project will increase exchange between the two countries and disseminate results throughout South-East Europe, create capacity to strengthen NECPs, pursue policy coherence, contribute to common objectives, support effective governance, train national and local public officers and enable civil society and national stakeholders to contribute proactively to the NECPs. By the end of the project, civil society and stakeholders will have increased their role in developing and implementing action plans for building renovation and in strengthening and creating new networks. Target groups will be informed about changes introduced by the Clean Energy Package for all Europeans and will be trained to incorporate renovation strategies in energy and climate plans. Partners will communicate with public officers and stakeholders, train 50 public officers and stakeholders in 10 municipalities and support the development of at least 10 municipal renovation strategies. 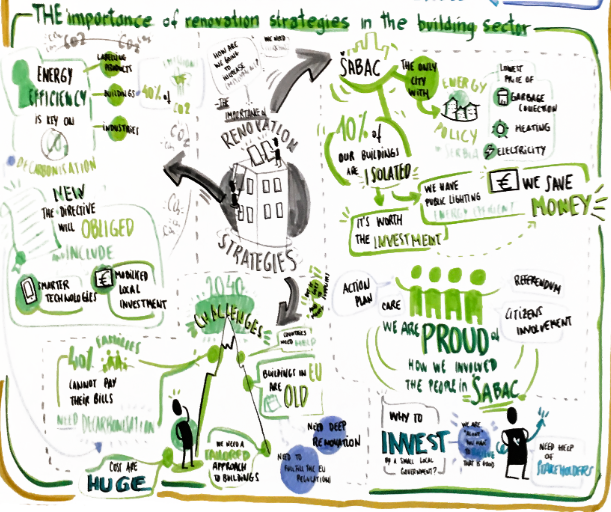 The importance of renovation strategies in the building sector. Source: EmBuild. Designer: Visuality. Policy makers at regional and municipal level throughout Europe struggle to implement measures to boost renovation activities, and local players face multiple challenges in developing and implementing renovation strategies and climate plans. The local authorities’ limited involvement in national planning, the lack of capacity to contribute to national strategies and develop local strategies, and a shortage of financial and technical expertise are only some of the challenges. These challenges are particularly prevalent in the project’s target countries, Bulgaria and Romania, which are characterised by similar building stock, large run-down communist-era blocks and inefficient individual homes, contributing to air pollution and high CO2 emissions. This project is part of the European Climate Initiative (EUKI). EUKI is a project financing instrument by the German Federal Ministry for the Environment, Nature Conservation and Nuclear Safety (BMU). The EUKI competition for project ideas is implemented by the Deutsche Gesellschaft für Internationale Zusammenarbeit (GIZ) GmbH. It is the overarching goal of the EUKI to foster climate cooperation within the European Union (EU) in order to mitigate greenhouse gas emissions.